What a brilliant day Saturday 22nd September 2018 was – the first Peoples Walk for Wildlife took place! 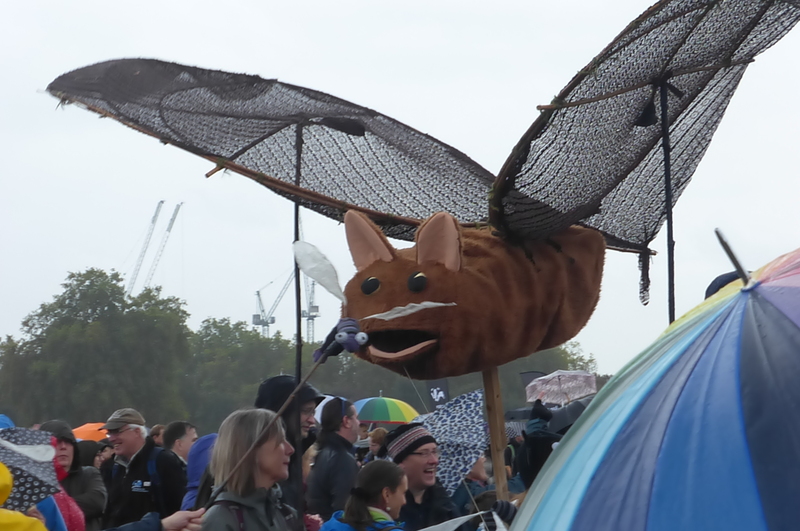 Over 10,000 people who support and care about wildlife in all its forms gathered at the Reformers Tree in Hyde Park at 10.00 am. The stage was set, with many wildlife organisations present including the RSPB, Wildlife Trusts, Friends of the Earth, Woodland Trust, WWF, Zoological Society of London, League Against Cruel Sports, Population Matters, Save the Asian Elephants, The Green Party. 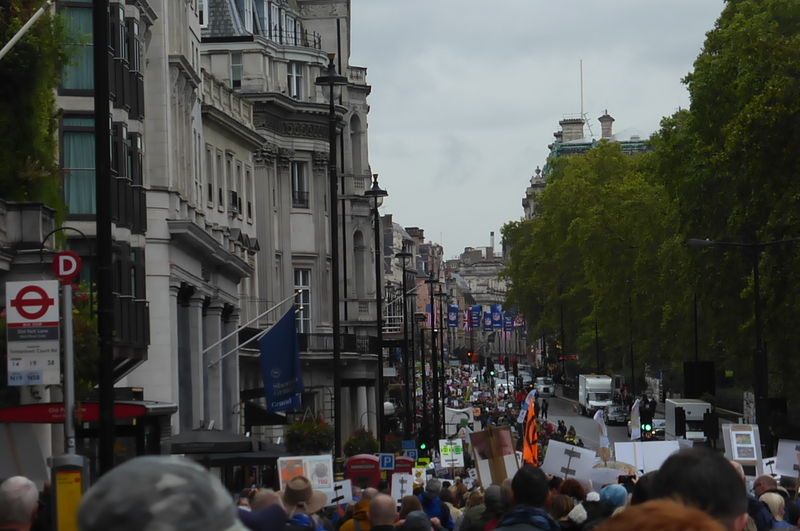 People from all areas of wildlife interest were also present including bird watchers, botanists, scientists, farmers, hunt saboteurs, activists and others who were coming together regardless of their area of interest. 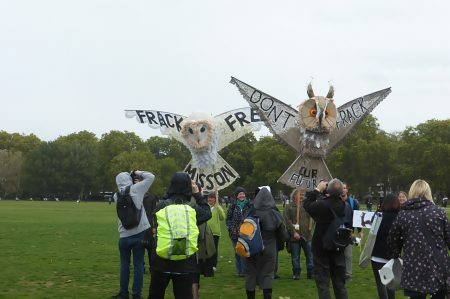 Many had dressed up, others wore masks or carried placards or signs – the stars of the show however were two huge owls and an enormous bat which skimmed above the crowd munching on equally oversized insects as it went. The main aim of the day was to highlight nationally the plight of our wildlife to a wider audience. Many young people were interviewed, children talking eloquently about their love of butterflies, birds, bats, and many more. They brought smiles to our faces and tears to our eyes. Their delivery was simple “our wildlife is in trouble and we must do something about it now” this message came across continually. The basis of the speakers at the meeting were the “ministers” who had come together to create the Manifesto for Wildlife, enthusiasts and experts in their field, coming together to unite in their desire to turn around the devastating loss of wildlife in the UK. Soon it was time for the talk to stop and the walk to start. Downloaded birdsong was played on mobile phones, the streets of London were filled with the sound of nightingales, willow warbler, robin, chaffinch, blackbird and many more. A cheer went up as we walked along Piccadilly (which had been closed to traffic) when a peregrine falcon gave a low fly-past. Vehicles hooted, members of the public joined us as we walked along, many waved and cheered as we neared Downing Street. Here, Chris Packham and the young speakers delivered the Manifesto to Number 10 Downing Street. A copy is being delivered to every MP in the UK. Why not write to your MP and ask what they think of the Manifesto. The Manifesto for Wildlife is a first draft of 200 things which we could introduce to help to turn around the plight of our Wildlife. It has been drawn up by 18 “ministers” experts in their field, coming together united in their desire to turn around the devastating loss of wildlife in the UK. Each “ministry” has come up with 10 commandments. The Manifesto aims to unite people together from all walks of life, working together for the good of wildlife and in turn, for our own good. Putting pressure on those in power to put wildlife first and encouraging others to do so. This is the first draft of a new way of looking at how we manage our outdoor spaces, reduce our impact on the natural world and how we can change the way we think about wildlife, not as an adversary that has to be removed, but as a key to our own survival, health and wellbeing. It makes very easy reading and all the references and evidence are fully reported in the unillustrated version. It was an amazing day that we were proud to be part of. Disappointed that Mr Gove hadn’t been able to receive the manifesto but not entirely surprised. I hope he responds soon. You can’t ignore the fact that 10,000 people walked to Downing St to deliver a message that needs addressing immediately. We’ll keep on until we get some action for the sake of our wildlife. It was great to see you both there, just sorry we couldn’t keep together! Excellent post Sue and glad that you, Julie and Chris made it there. Shame that we had prior commitments, otherwise we would have joined you.